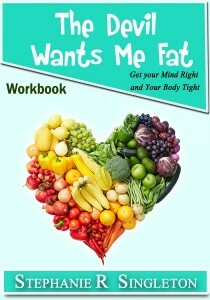 This is an eight week, self-guided companion workbook to The Devil Wants Me Fat: Lessons to Inspire, Empower and Overcome designed to help individuals identify and address the issues that surround their emotional eating. The curriculum is ideal for small group studies or in an individual setting with an accountability partner. Each week’s lesson focuses on an issue that surrounds emotional eating and gives Biblical guidance to help participants self-reflect and evaluate their emotional attachment to food. Have you ever been called fat? Do you feel guilty and ashamed when you overeat? Have you ever felt challenged about whether or not you are considered a glutton? These questions and others are confronted through the personal stories of the author, Stephanie Singleton. 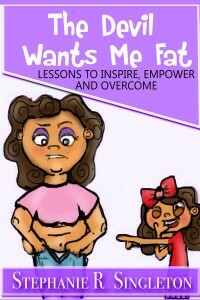 She shares an autobiographical account of her personal struggles and victories with weight loss and takes readers on her personal journey to investigate the pain surrounding emotional eating.Through utilizing biblically inspired lessons, she has been able to go from a size 20 to a size 8. Singleton shares the lessons that she has learned throughout her years of her weight fluctuations and is transparent as she provides a practical approach to understanding the spiritual battle surrounding emotional eating. This is a book to help those in the incredible calling to work with youth. It includes scripture, prayers, reflections/activities and suggestions on how to use the book. Your actions and words can inspire greatness, show compassion, teach kindness, and reveal God. Making the choice to follow the disciplined path that promotes a healthy and fit lifestyle is not an easy decision for many to make. Once that decision is made, many people still have a difficult time staying focused and determining why their efforts are not successful. 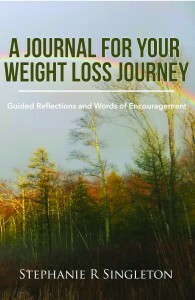 This self-reflective journal is creatively designed using Bible scriptures, weight loss stories, pictures, poems, words of encouragement, quotes and writing prompts to help people to stay focused on their fitness goals, while they begin to recognize the barriers that may affect them while involved in their personal weight loss battle. This book contains everything a leader and accountability partner needs to facilitate the eight sessions geared towards using a Biblical approach to deal with emotional eating.